Often times when I used to work with clients and now internally, I am surprised to see how many SiteCatalyst users don’t take advantage of Comparison Reports within the SiteCatalyst interface. In this post I will review these reports so you can decide if they will help you in your daily analysis. As you can see, SiteCatalyst adds a “Change” column where it displays the difference between the two date ranges. This can be handy to spot major differences between the two date ranges. 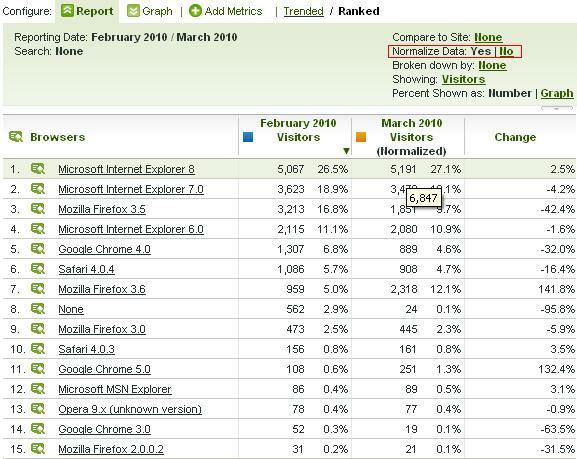 In this case we can see that “Microsoft Internet Explorer 8” had a big increase and that “Mozilla Firefox 3.5” had a decrease (probably due to version 3.6!). You can compare any date ranges you want from one day to one year vs. another year. If you look closely, you will see that the March 2010 column has been normalized when we clicked the “Yes” link shown in the red box above. 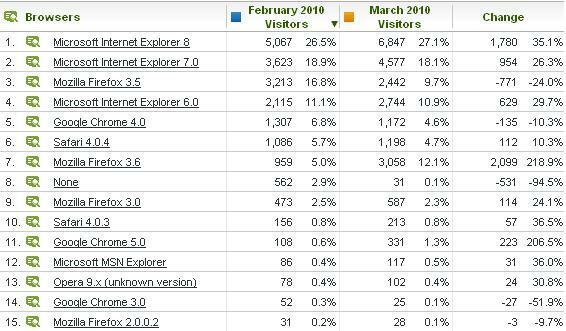 By doing this, SiteCatalyst has reduced the numbers in the March 2010 column to assume the same number of Visitors as there were in February. If you want to normalize such that February is increased to match March, you simply have to reverse the date ranges so when you select your dates, March is the first column and February is the second column (the second column is always the one that gets adjusted). As you can see, the “Change” column is now dramatically different! In this version, “Microsoft Internet Explorer 8” no longer looks like it has changed much. I find that using this feature allows me to get a more realistic view of date range differences. Finally, you may notice a tiny yellow box in the preceding report image (says “6,847”). This is a secret that not many people know about. When you normalize data, Omniture artificially reduces or increases the values in the normalized column. But if you want to see what the real value is (if not normalized), you can hover your mouse over any value and you will see a pop-up with the real number! If you look at the first version of the report (the one before we normalized), you will see the same “6,847” number in the first row of the report… Pretty cool huh? 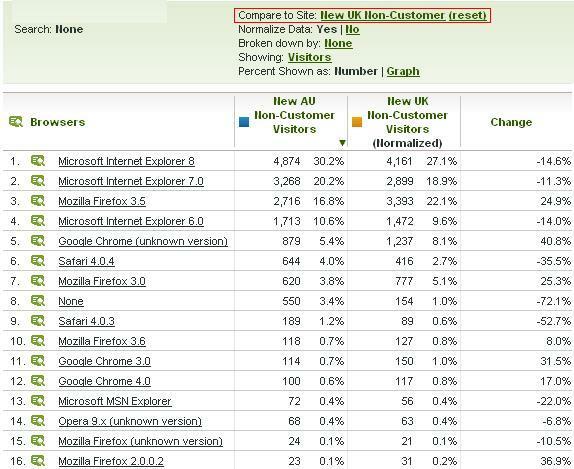 This second type of Comparison Report is the one that fewer people are aware of or have used. 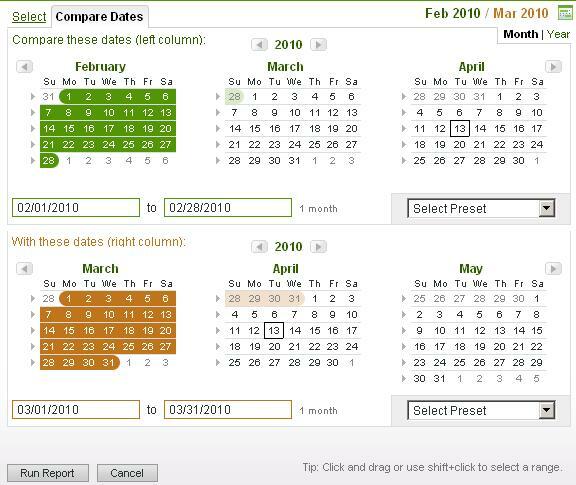 In this type of comparison, instead of comparing date ranges you compare different report suites. Obviously, this only makes sense if you have more than one report suite, but it also works with ASI slots so don’t assume this isn’t relevant to you if you have just one report suite. Much of the mechanics of this are similar to the steps outlined above. You simply open one report (in this case we will continue to use the Browser report) and then choose the “Compare to Site” link and choose a second report suite or ASI slot. In this case, I am showing an example of the Browser report for two different geographic locations. Since most report suites have different totals, I tend to use Normalization more in these types of comparison reports. Normalizing is when SiteCatalyst creates a multiplication factor of the line items. So for example I ran a pages report and compared the week of April 4th to the week of April 11th. The first page ‘Home’ had 12,833 page views for 4/4 to 4/10 and 12,068 page views for 4/11/ to 4/17. If you check the normalize setting then the page views for 4/11/ to 4/17 go to 12,596. Can you not run this report on regular standard metrics? I would like to do YOY comparisons for basic metrics like visits, revenue, orders, etc.